I’m been loving the old photos friends are sharing on Facebook for Throwback Thursdays. 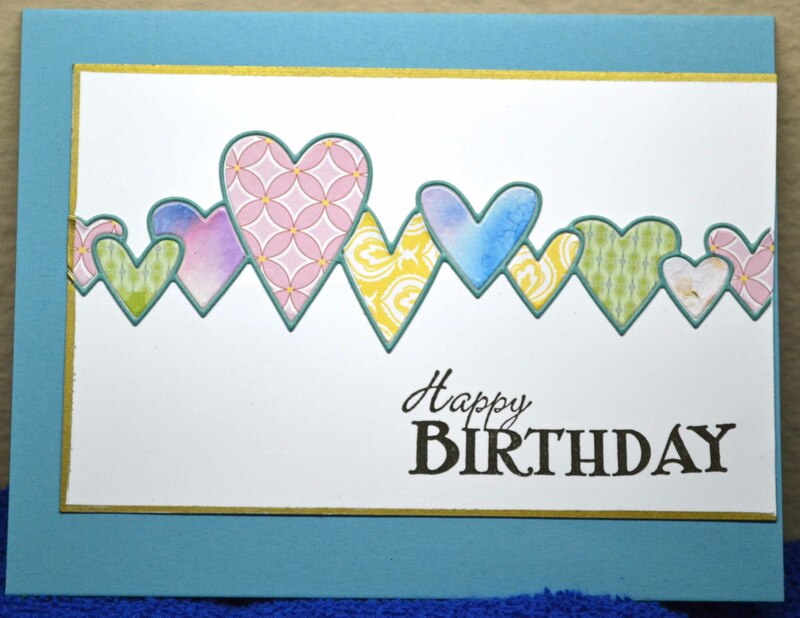 Thought I’d share some cards made loooooong ago when I first started stamping. I found these cards while cleaning out my mother’s desk. I had apparently given her a stack of handmade cards years ago — guess she couldn’t stand to part with them! Although this card looks so unsophisticated and … well, not very good, I do remember how excited I was to discover this technique. 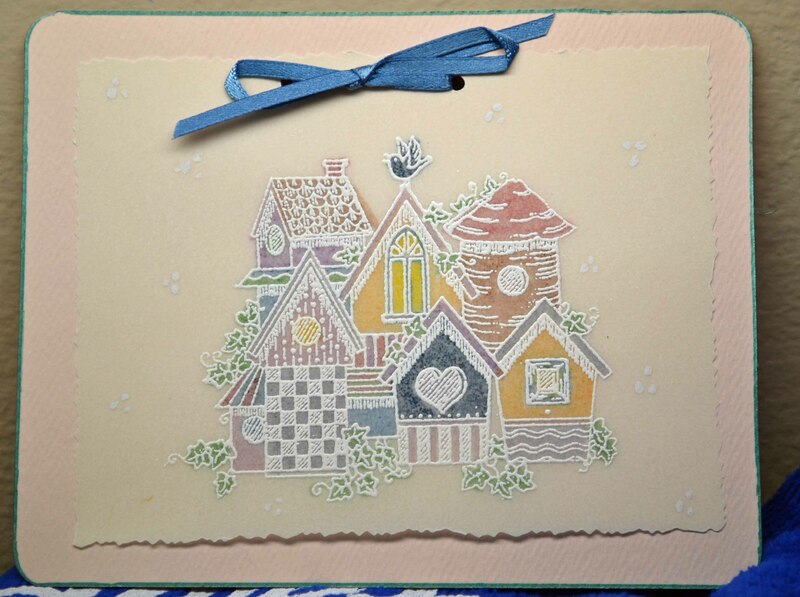 I stamped and embossed in white, then colored the birdhouses on the back, using markers. The image is from Hero Arts. And I still love it (although I haven’t used it in years). 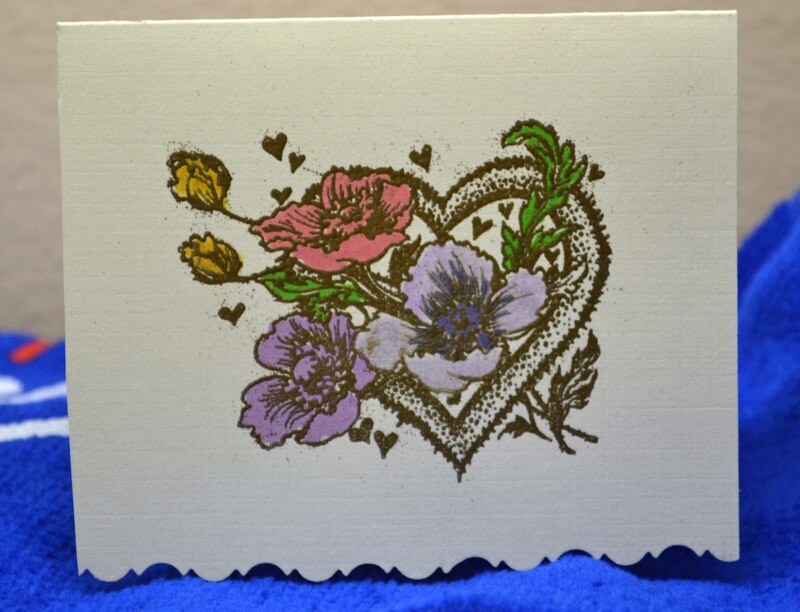 This flowery heart was one of the first stamps I ever bought! Very simple — stamp, emboss, color. I don’t even know where that stamp is now. It may have been an old PSX stamp. Anyone remember that company? So easy — stamp the block, over-stamp it with an image. Thanks for joining me for this trip down memory lane. I like to think I’ve evolved from those early days! 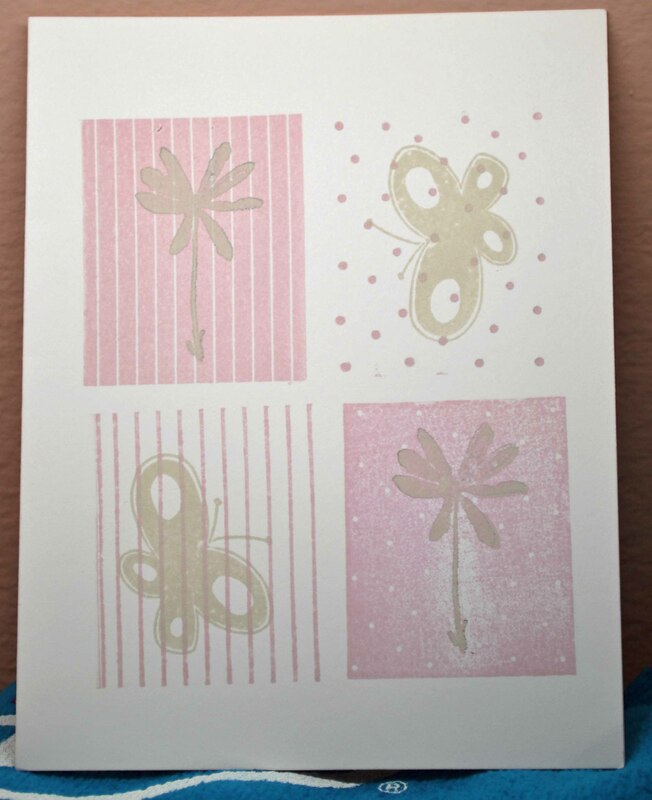 While cleaning out my closet recently I came across some cards I made when I first started stamping. This was one of my first background stamps (from Hero Arts). I didn’t keep track of what I used back then, but it looks like I stamped in purple and used a holographic powder for the lines. The jester is from Judikins. I think I acquired the jester at one of the first stamp shows I attended — the Original Rubber Stamp Convention in Carson, Calif. I also bought a matching stamp, a ballerina. 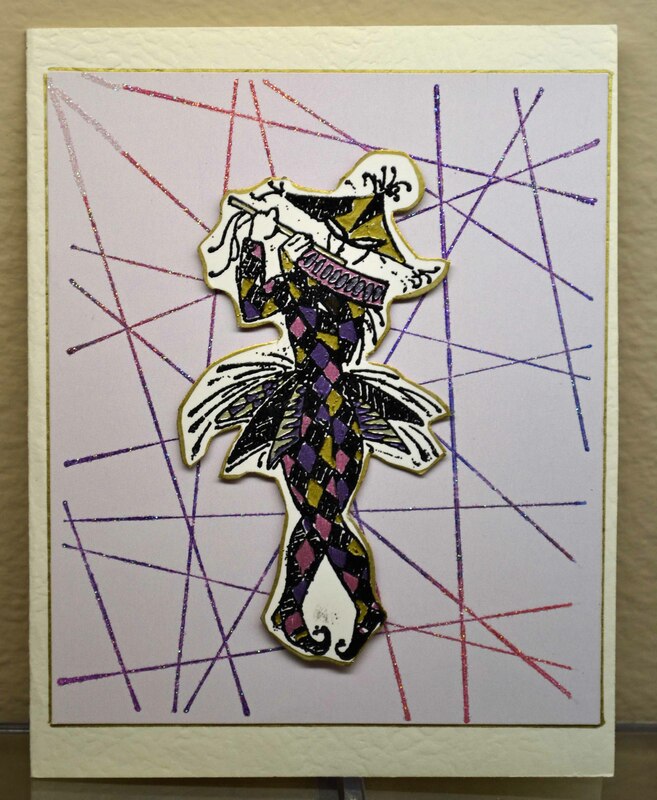 I embossed the jester in black, then colored him in using gel pens (which I borrowed from my daughter. I had much fewer supplies back then!!). My sad first embossing attempts. Sigh. 1. 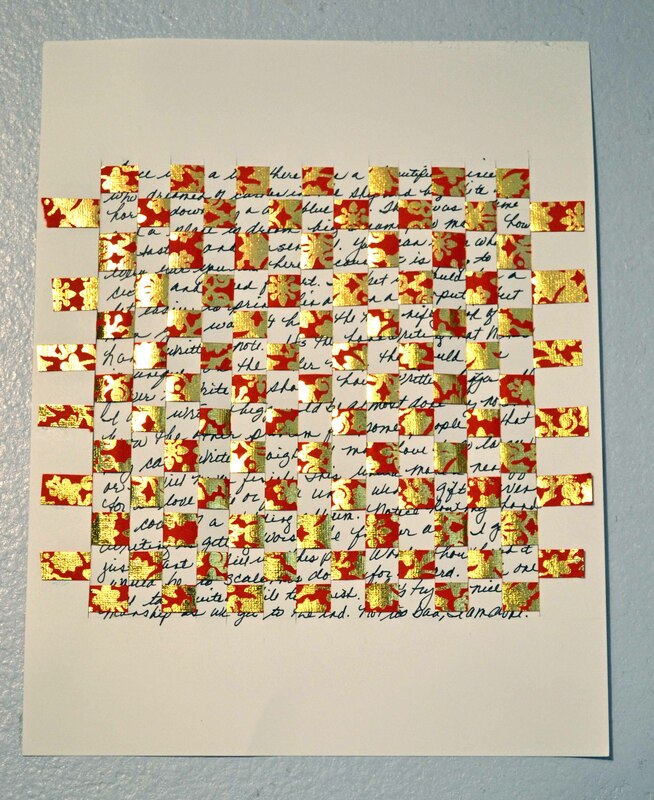 On a piece of plain paper, create your weaving base. Figure out your sides, top and bottom margins (I used 1/2 inch here). 2. Using a permanent black marker (I used my favorite Faber-Castell PITT Artist pen, medium point) begin to write. Write anything you want, no one will be able to read it! Or copy a poem or words to a song …. 3. 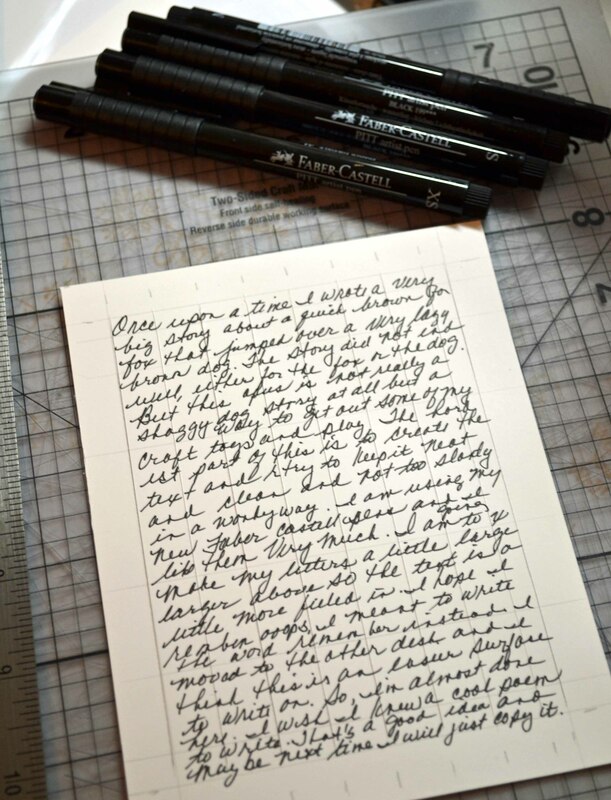 When done writing, lightly pencil in vertical lines — these will be your cutting lines. (I made them mostly 1/2 inch, making just a pencil tick at the top and bottom of my vertical margin.) Using a sharp craft knife and a metal ruler, slice into your paper, making these vertical slices. Do NOT cut into your margins! 4. Carefully erase all pencil lines. 5. Cut some light-weight paper (wrapping paper weight works well) into strips (they can be all the same width or varied) long enough to fit across the width of your base card, with a little extra. 7. 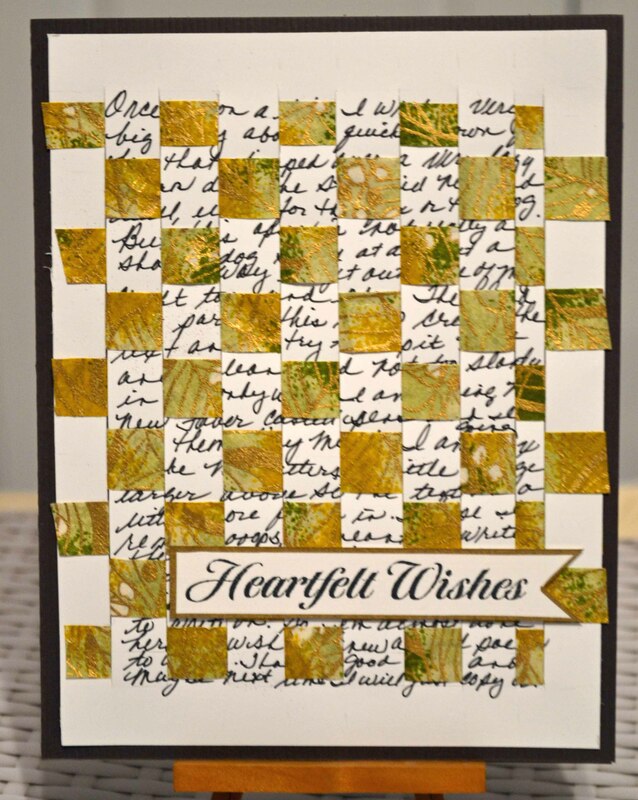 When finished, secure the ends of your woven pieces, then attach this piece to card base. My supplies included: WorldWin paper for card base; Paper Source decorative paper for the weaving; Faber-Castell PITT Artist Pen for the writing. Stamp sentiment is Hero Arts, stamped in black VersaFine. Yowzas, I love this new die from Simon Says! It’s Heart Parade and playing with it makes me want to march with a band! What a Fabulous Find! The sentiment is from Inkadinkado’s Occasions clear set (a set I use VERY often). The base paper is from WorldWin. I glued the small pieces down with Elmer’s fine line glue pen. I love the blue pearlized paper (WorldWin)! 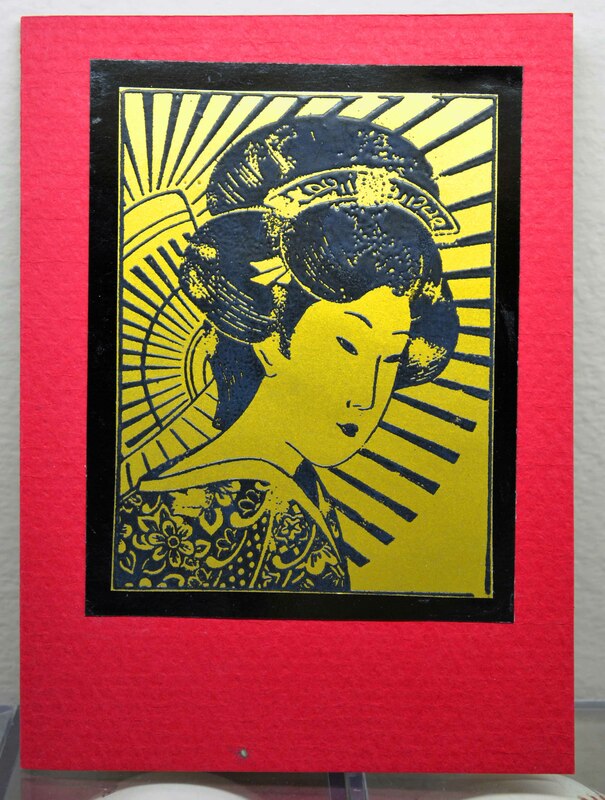 I cut the pearlized paper using Spellbinders’ A2 Curved Matting Basics A S5-171. 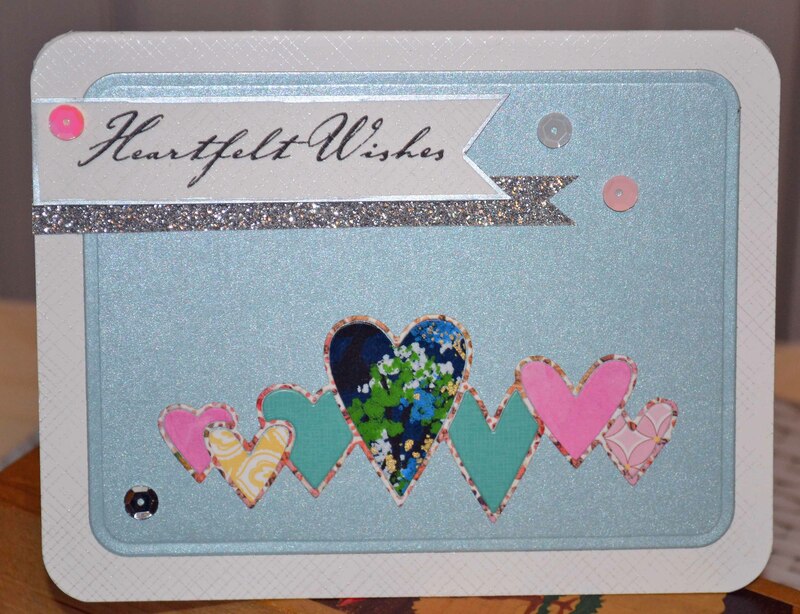 I stamped the white base card using Hero Arts’ envelope Pattern S5507 inked with Imagine Craft’s Platinum Planet Brilliance. 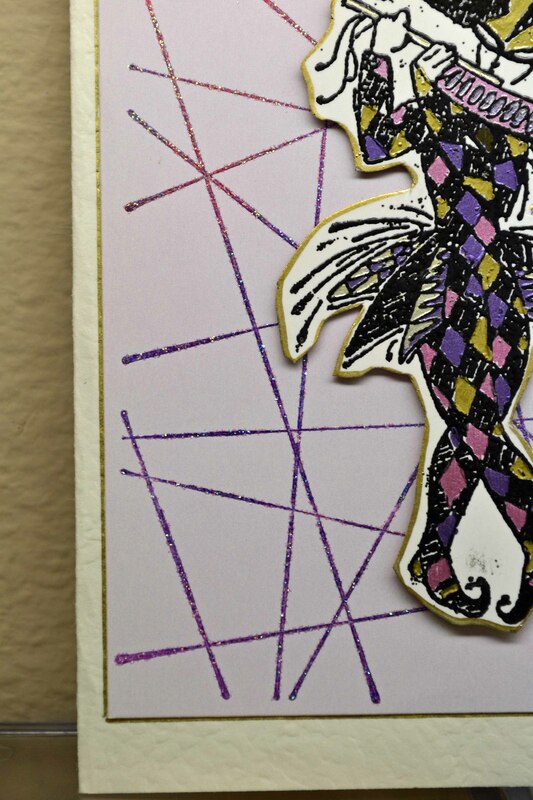 The sequins, from Doodlebug Designs, were attached using Glue Dots’ micro dots — perfectly mini sized for these sequins! And no messy liquid! 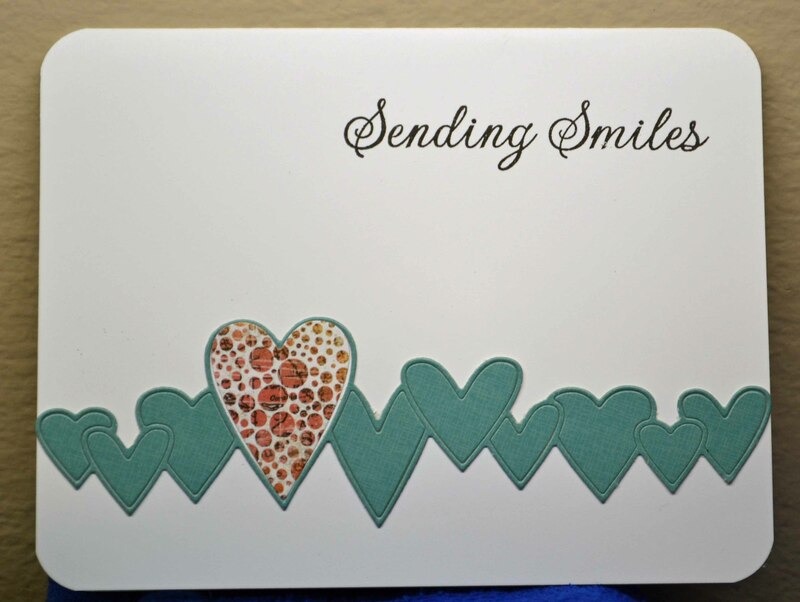 I stamped a scrap piece of white with the same envelope pattern, then added the sentiment (Hero Arts) in VersaFine black. I wanted more bling, so added a piece of silver glitter tape (Close To My Heart). This next one didn’t turn out as I expected, but it worked. I tried to cut the die on a thicker piece of cardstock and it didn’t cut all the way through. I started to painstakingly cut out the pieces with my Xacto knife, when I smacked myself on the head and said, “Just leave the pieces in there, doofus.” (I often call myself names.) 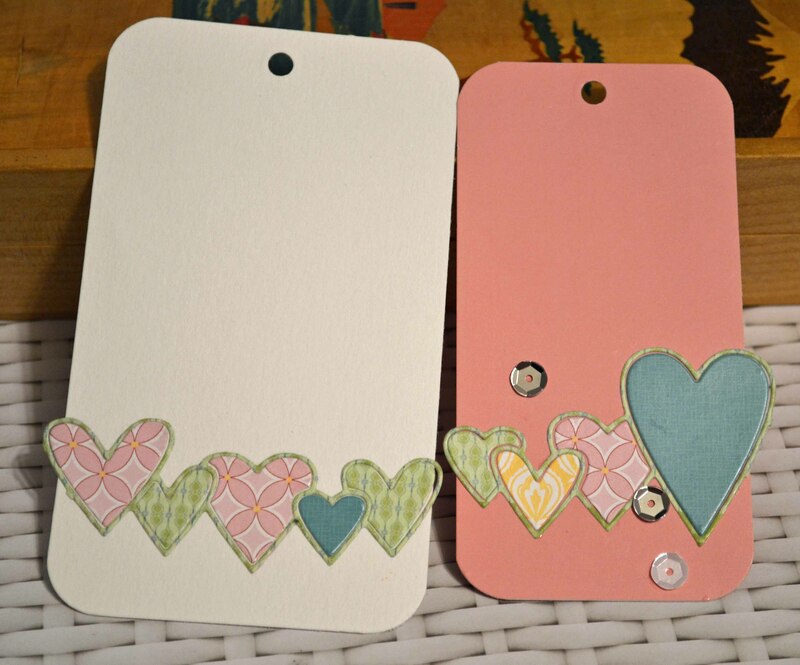 The large heart popped out easily, so I switched it out with a patterned piece, but left the others in plae. I rounded the corners, stamped a sentiment (Hero Arts) and stick a fork in me, I’m done. One last trick before I go…. 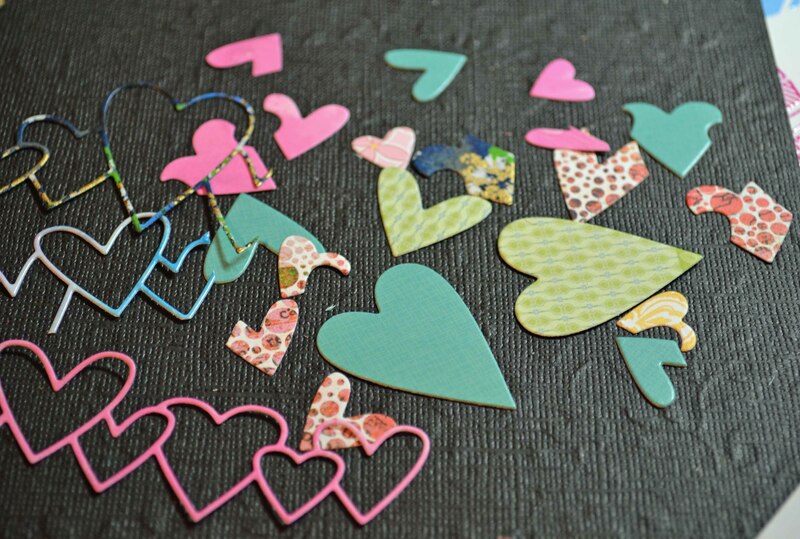 When you keep cutting out the heart to get different insides, you get several outlines, too. Whew! This is a loooong post! But as you can see, I’m crazy about this die.